Ever walk into an ice creamery and wonder how they do it? Well, with the Kitchenaid Ice Cream Maker you can easily make all the frozen treats your heart desires with hardly any effort. Simple to use, affordable, and adaptable to other Kitchenaid tilt-stand and bowl-tilt mixers, the Kitchenaid Ice Cream Maker is a great addition to the kitchen. What Is a Kitchenaid Ice Cream Maker? Making homemade frozen treats like ice cream, gelatos or sorbets can be a daunting and confusing task, but the Kitchenaid Ice Cream Maker makes it easy. Double insulated with an easy-to-use paddle, this Kitchenaid Ice Cream Maker is a joy to use for both its simplicity and handy features. Simply attach it to your mixer, add in the ingredients, and you’ll have a delicious frozen treat in no time at all. You can even place the bowl directly in the freezer after you finish, making cleanup a breeze. This ice cream maker can create anything from gelatos to sorbets and of course, ice cream. The Kitchenaid Ice Cream Maker comes with a dasher paddle that attaches directly to the mixer and sits perfectly inside the bowl. The bowl itself is double insulated with a liquid that freezes and keeps the contents inside frozen evenly, giving your frozen deserts the right consistency. It also has up to a 7-quart capacity, allowing you to make enough ice cream for everyone to share. The handles on the bowl are perforated, making it easily compatible with any Kitchenaid tilt-stand or bowl-lift mixer. This way if you change out and get a new mixer, you’ll never have to replace your Kitchen aid Ice Cream Maker. The dasher paddle is double sided, allowing it to fit multiple motor heads and mix at a low speed, making your ice cream even and perfect. It even comes with recipes in the manual so that you can start making ice cream right away. The Kitchenaid Ice Cream Maker is very affordable and can be purchased for around $80. It can easily be found in shops like Kohl's, Target, Amazon, and Walmart. Simple and adaptable to any Kitchenaid tilt-stand or bowl-tilt mixer, it takes all the guesswork out of putting it together and putting it to use. The only downside is placing the bowl inside of the freezer before whipping up your favorite frozen dessert so that the liquid can freeze and keep your ice cream or sorbets the right consistency. Kitchenaid really made sure that its ice cream maker has a sleek design and fits fairly well in most freezers. The Kitchenaid Ice Cream Maker has a double-sided dasher paddle, allowing it fit almost any mixer model they have. The bowl is a clean, bright white color and well thought out. The capacity of the Kitchenaid Ice Cream Maker is 7 quarts, which equates to nearly 2 gallons of ice cream in total. That’s enough ice cream to feed a whole birthday party full of hungry ice cream lovers. Once the ice cream is made, it can last a while, making it definitely worth the effort to whip up. This product comes with only a one-year warranty from Kitchenaid, so treat it gently and be sure to follow the instructions for use. The plus side is Kitchenaid will absolutely replace the Kitchenaid Ice Cream Maker with its hassle-free replacement warranty. Take it to an authorized Kitchenaid Service Center or call their Customer Experience hotline number located in the user manual. The Whynter ICM-15LS is a great addition to anyone’s kitchen and definitely comparable to the Kitchenaid Ice Cream Maker. It’s a standalone maker that is self-refrigerating, making it super easy to use. Clean up for this product is simple as well, and it can make about a quart and a half of ice cream per use. Unfortunately, this brand of ice cream makers is quite expensive, costing about $266.00. 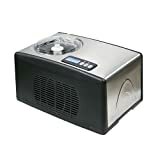 It’s definitely a pricey piece of equipment, and most of the cost comes from its self-refrigeration mechanism. However, it’s not a bad price for something that takes all the work out of making ice cream. This ice cream maker is completely uncomplicated and has been reviewed as one of the best ice cream makers out there. No need to add salt or pre-freeze any mixing bowls: just add the ingredients you want, turn it on, and that’s all. It’s also easy to clean and makes very smooth ice cream. It even has an audio timer so you can do other things while you wait for it to finish. The overall design of the Whynter ICM-15LS is rather boxy and takes up a considerable amount of kitchen space. The dimensions of this product are 18” wide by 10” tall and 11” in depth. That’s a big chunk of your counter space gone and could make it hard to find places to store it. The biggest downside of this ice creamer maker is its capacity. It holds only about one and a half quarts in total, which makes only enough ice cream for a few people at most. The amount of ice cream this model produces is on par with a typical 48oz carton of store-bought ice cream. Just like the Kitchenaid Ice Cream Maker, the Whynter ICM-15LS comes with a one-year warranty. The biggest downside to this is the warranty is listed as limited in the owner’s manual so it would be wise to be extra careful with this product for the price you spend on it. The warranty also mentions that its limitations on replacement include acts of God, accidental damage and the customer would need to pay for shipping and handling of the replacement. Taking ice cream making to the next level is the Breville BCI600XL Smart Scoop Ice Cream Maker. This ice cream maker is so simple all you have to do is plop in your ingredients, push a button and forget it. This product even comes with 12 different hardness settings so you can make your ice cream extra thick or extra creamy, depending on your preference. It also has a handy cooling function so you can enjoy your ice cream whenever you like without taking up space in your freezer. By far one of the more expensive ice cream makers. The cost of the Breville BCI600XL Smart Scoop Ice Cream Maker could set you back about $390 before shipping and handling. That’s a big price to pay just to make ice cream. The Breville BCI600XL Smart Scoop Ice Cream Maker is one of the easiest to use. Choose your ice cream hardness setting and let it do the rest. Push a button and forget it; this ice cream maker does all the work for you. Scooping out your ice cream is easier too. This ice cream maker has a much smaller design comparable with the Kitchenaid Ice Cream Maker. Its rounded curves and easy to navigate LCD display make this ice cream maker functional in any kitchen. Made out stainless steel for a painless cleanup, this design choice gives this ice cream maker a modern look. Its dimensions are 15” wide by 11” inches tall and 11” deep which takes up less room and makes it easier to store for later use. Here’s where this wonderful ice cream maker disappoints. Despite all its neat features, this ice cream maker only makes one and a half quarts. Though you can mix and forget it, you won’t get much out of it and can expect to be making more ice cream very soon. The Lello 4080 Musso Lussino ice cream maker makes ice cream with the press of two buttons. Pour in what you need and let this ice cream maker do the rest, just set your timer for the desired frozen treat you’d like. 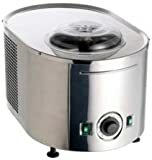 This ice cream maker can create up to one and a half quarts of ice cream in 30 minutes and is made out of stainless steel for easy clean-up. Ice cream isn’t the only sugary connection it makes, this ice cream maker can create, Italian gelatos, sorbets, frozen yogurt, and even frozen drinks. It can even be used for businesses, making this a great product for large events. One of the most expensive at home ice cream makers on the market. If you’re looking to purchase the Lello 4080 Musso Lussino plan on spending about $735.00 in total. That’s some seriously expensive ice cream. This ice cream maker keeps it simple. It comes with two buttons and a turn style knob allowing you to toss in your desired ingredients and set it for your frozen confection of choice. This product also comes with a few recipes in the owner’s manual so you can make whatever frozen treat you’d like. Its removable bowl and wand also makes it easy to clean and store in the freezer for later. The overall design of the Lello 4080 Musso Lussino leaves much to be desired. The shape of it is like that of a crock pot, with two very basic switches and a turn-style knob. It has four legs, making this a freestanding ice cream maker that weighs 38 pounds. The dimensions on this product are 12” wide by 11” tall and 18” deep. It might be easier to store based on its dimensions, but it weighs a ton. The overall capacity is small, only making up to one and a half quarts in all. Despite its ability to be used professionally, you would need to make your frozen creations over and over again in order to have enough. For frozen drinks, this size is actually doable but would still require constantly remaking frozen drinks. This product is a limited product warranty that can only be used for manufacturer’s defects. Looking closer at the warranty you can see that they give no list of what else that entails, just a 1-800 number and a statement that even though its made in Italy, that does not guarantee quality. Definitely not the greatest warranty for the cost of this product. Despite having to pre-freeze the bowl and having to own your own mixer, the Kitchenaid Ice Cream Maker is truly the best way to make ice cream. It’s cost efficient, easy to use, easy to clean and easy to store. This product also has a much better overall product warranty than its competitors. 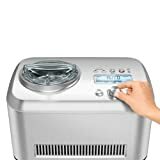 We give this ice cream maker 4 out of 5 stars. Get your Kitchenaid Ice Cream Maker today.